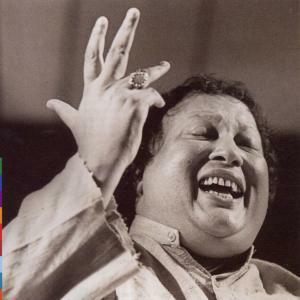 Ustad Nusrat Fateh Ali Khan (Punjabi: ???? ??? ??? ???) (October 13, 1948 - August 16, 1997) was primarily a singer of Qawwali, the devotional music of the Sufis, a mystical offshoot of Islam. Traditionally, Qawwali has been a family business. Nusrat's family (originally from Afghanistan, though they had been living in Pakistan for a large part of their lives) has an unbroken tradition of performing qawwali for the last 600 years. Nusrat took over his family's qawwali party in 1971 after the death of his father and his uncle. In Pakistan, his first major hit was the song "Haq Ali Ali". This was performed in a traditional style and with traditional instrumentation, and featured only sparse use of Nusrat's innovative sargam improvisations. Nevertheless the song became a major hit, as many listeners were attracted to the timbre and other qualities of Nusrat's voice. He reached out to Western audiences with a couple of fusion records produced by Canadian guitarist Michael Brook. In 1995, he collaborated with Eddie Vedder on the soundtrack of Dead Man Walking. His contribution to that and several other soundtracks and albums (including The Last Temptation of Christ), as well as his friendship with Peter Gabriel, helped to increase his popularity in Europe and the United States. Peter Gabriel's Real World label released five albums of Nusrat's traditional Qawwali performances in the West. He also performed traditional Qawwali live to Western audiences at several WOMAD world music festivals. Nusrat was noted for introducing other forms of improvisation into the style. From his classical music training, he would interject much more complex alap improvisations, with more vibrato and note bending. He would also interject sargam improvisations. While it is undoubtedly difficult to put into words what makes Nusrat's music appeal so deeply to so many listeners, many of whom do not understand a single word of the languages he sings in, here is one fan's attempt to explain: "Nusrat's music invites us to eavesdrop on a man communing with his God, ever so eloquently. He makes the act of singing a passionate offering to God. But we do not merely eavesdrop. The deepest part of Nusrat's magic lies in the fact that he is able to bring our hearts to resonate with the music, so deeply, that we ourselves become full partners in that offering. He sings to God, and by listening, we also sing to God." "Singing with Nusrat was pretty heavy," says Eddie Vedder. "There was definitely a spiritual element. I saw him warm up once, and I walked out of the room and just broke down. I mean, God, what amazing power and energy." The late American rock singer Jeff Buckley paid tribute to Nusrat on the album "Live at Sin-?". In his introduction, he states, "Nusrat, he's my Elvis," before performing the song "Yeh Jo Halka Halka Saroor Hai". This recording generated interest in Nusrat among an audience that was previously unaware of his music. In 2005, a tribute band called Brook's Qawwali Party was formed in New York City by percussionist Brook Martinez to perform the music of Nusrat Fateh Ali Khan. The 11+ piece group performs (mostly instrumental) jazz versions of Nusrat's traditional qawwali songs, using the instruments conventionally associated with jazz (saxophones, brass, electric guitar, double bass, djembe, drum set, and percussion) rather than those associated with qawwali.